Southern Right Charters is a respected operator which has been in business since 1999. The company is progressive and environmentally sensitive, operating with the motto and ethos of “Observing NOT Disturbing”. 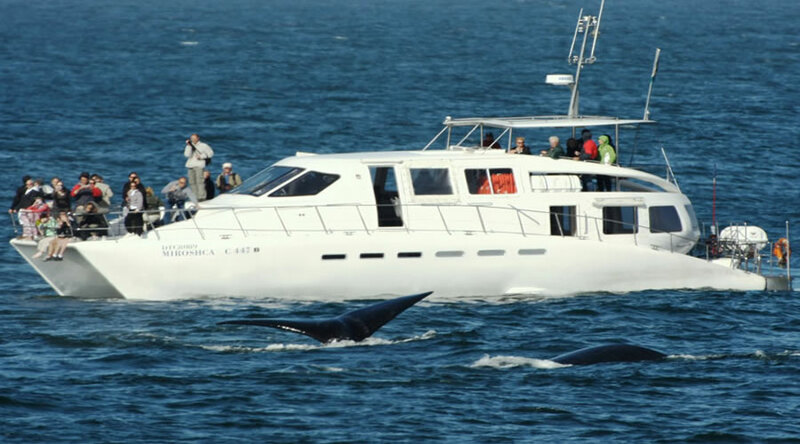 Southern Right Charters offers boat-based whale watching tours from the New Harbour in Hermanus, the Capital of the Cape Whale Coast, and operates within the local waters of Walker Bay, regarded as one of the best whale watching areas in the world. Our whale watching boat was purpose built to ensure maximum passenger comfort and superior stability. The different areas offers spectacular viewing opportunities, with the side and front deck giving that up close view of the whale and sun deck above giving you that panoramic view of the entire whale. Southern Right Charters is licensed to carry 70 passengers and 5 crew members. Daily trips, during whale season (June –December) at 9h00, 12h00 and 15h00 daily. All trip are weather permitting. Arrival time is 30 minutes prior for our on land briefing before we head down to our floating jetty to board the boat. Our permit entitles us to approach the whales up to 50m and then we stop to observe. Being naturally curious, the whales normally approach the boat to observe us! This is an inspirational experience to be treasured. During the tour our friendly crew is on hand to make sure you have a great experience, from helping you get the perfect photo opportunity to serving your light refreshments. Our Whale Specialist guide will interpret the marine life encountered en-route and provide insight into the behavior of the whales while you are watching them in action. Our interpreter guide keeps our European guests informed throughout the tour and our videographer will ensure that the best footage is captured.